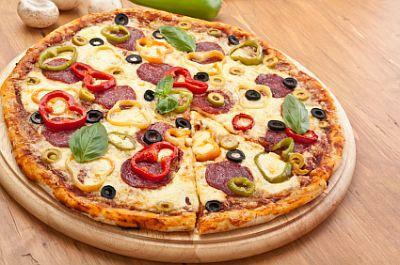 Families living a gluten free lifestyle will find life a lot easier with a good recipe for gluten free pizza dough. Look for a recipe that suits your family, smother it with toppings of your choice, and enjoy! Do not expect gluten free pizza dough to behave like wheat based dough. You might be able to enjoy the flavor and texture of your favorite pizza, but it is not recommended that you try to toss this dough in the air for shaping. The dough will be very sticky, its consistency somewhere between a soft dough and a thick batter. Coat your hands or spatula in oil before attempting to work with it to cut down on mess and waste. Manually smooth the mix over the pan and partially bake it before layering on the toppings. If you are already living gluten free, most of these ingredients will already be staples in your pantry. If you are just getting started, look for any unfamiliar items in the gluten free section of your favorite health food supplier or bulk store. If you are unsure of what you are buying, ask store staff for assistance. For example, potato starch and potato flour might look similar, but they perform very differently in recipes. Be sure to get the exact ingredients to avoid disappointment. This recipes makes one thick crust pizza or two small thin crust pizzas. Preheat oven to 425F (220C)In a medium-sized bowl, mix dry ingredients together and set aside. Dissolve honey or agave in water and sprinkle yeast over top to dissolve. Add the rest of the wet ingredients and mix well. Stir the mixture into the dry ingredients. Dough will be very soft. Spread the dough into a greased pizza pan. Allow to rise in a warm place for 30 minutes. Bake for five to ten minutes until crust is beginning to brown. Remove from oven and spread with sauce, toppings, and cheese. Return to oven until cheese is brown and bubbly. Cooking from scratch is nice, but it can also be helpful to have a mix on hand for those busy nights when you are just looking to make a quick and easy meal. For that purpose, a number of popular gluten free baking brands have devised ready-to-mix gluten free pizza doughs. 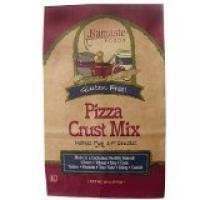 These mixes make homemade gluten free pizza almost as easy as pizza delivery. Chebe Bread Products: Tapioca-based products are available as dry mixes or frozen dough. Each package makes two small pizzas. Once you find a mix or recipe you like, make a large batch and bake several crusts ahead of time. Wrap well and freeze for a quick meal when you are in a hurry. Simply take a frozen crust out of the freezer, pile on your favorite toppings, and pop it in the oven. This gives you all the taste and convenience of a frozen wheat-based pizza, but in a safe, healthy, and pain-free way.